PRNP (PRioN Protein) is the human gene encoding for the major prion protein PrP (for prion protein or protease-resistant protein), also known as CD230 (cluster of differentiation 230). Expression of the protein is most predominant in the nervous system but occurs in many other tissues throughout the body. The protein can exist in multiple isoforms, the normal PrPC, the disease-causing PrPSc, and an isoform located in mitochondria. The misfolded version PrPSc is associated with a variety of cognitive disorders and neurodegenerative diseases such as bovine spongiform encephalopathy, chronic wasting disease, Creutzfeldt–Jakob disease, fatal familial insomnia, feline spongiform encephalopathy, Gerstmann–Sträussler–Scheinker syndrome, kuru, scrapie, transmissible mink encephalopathy, ungulate spongiform encephalopathy, and variant Creutzfeldt–Jakob disease. PrPSc is a conformational isoform of PrPC, but this orientation tends to accumulate in compact, protease-resistant aggregates within neural tissue. 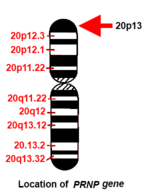 The abnormal PrPSc isoform has a different secondary and tertiary structure from PrPC, but identical primary sequence. Circular dichroism shows that normal PrPC had 43% alpha helical and 3% beta sheet content, whereas PrPSc was only 30% alpha helix and 43% beta sheet. This refolding renders the PrPSc isoform extremely resistant to proteolysis. ↑ "Diseases that are genetically associated with PRNP view/edit references on wikidata". ↑ Sparkes RS, Simon M, Cohn VH, Fournier RE, Lem J, Klisak I, Heinzmann C, Blatt C, Lucero M, Mohandas T (October 1986). "Assignment of the human and mouse prion protein genes to homologous chromosomes". Proc. Natl. Acad. Sci. U.S.A. 83 (19): 7358–62. doi:10.1073/pnas.83.19.7358. PMC 386716 . PMID 3094007. 1 2 Zomosa-Signoret V, Arnaud JD, Fontes P, Alvarez-Martinez MT, Liautard JP (2008). "Physiological role of the cellular prion protein". Vet. Res. 39 (4): 9. doi:10.1051/vetres:2007048. PMID 18073096. ↑ Damberger FF, Christen B, Pérez DR, Hornemann S, Wüthrich K (October 2011). "Cellular prion protein conformation and function". Proc. Natl. Acad. Sci. U.S.A. 108 (42): 17308–13. doi:10.1073/pnas.1106325108. PMC 3198368 . PMID 21987789. ↑ Chesebro B, Trifilo M, Race R, Meade-White K, Teng C, LaCasse R, Raymond L, Favara C, Baron G, Priola S, Caughey B, Masliah E, Oldstone M (June 2005). "Anchorless prion protein results in infectious amyloid disease without clinical scrapie". Science. 308 (5727): 1435–9. doi:10.1126/science.1110837. PMID 15933194. ↑ Barrette I, Poisson G, Gendron P, Major F (2001). "Pseudoknots in prion protein mRNAs confirmed by comparative sequence analysis and pattern searching". Nucleic Acids Res. 29 (3): 753–758. doi:10.1093/nar/29.3.753. PMC 30388 . PMID 11160898. 1 2 3 4 5 6 Linden R, Martins VR, Prado MA, Cammarota M, Izquierdo I, Brentani RR (April 2008). "Physiology of the prion protein". Physiol. Rev. 88 (2): 673–728. doi:10.1152/physrev.00007.2007. PMID 18391177. 1 2 Prčina M, Kontseková E, Novák M (2015). "Prion protein prevents heavy metals overloading of cells and thus protects them against their toxicity". Acta Virol. 59 (2): 179–84. doi:10.4149/av_2015_02_179. PMID 26104335. ↑ Ross CA, Poirier MA (July 2004). "Protein aggregation and neurodegenerative disease". Nat. Med. 10 Suppl: S10–7. doi:10.1038/nm1066. PMID 15272267. ↑ Pan KM, Baldwin M, Nguyen J, Gasset M, Serban A, Groth D, Mehlhorn I, Huang Z, Fletterick RJ, Cohen FE (December 1993). "Conversion of alpha-helices into beta-sheets features in the formation of the scrapie prion proteins". Proc. Natl. Acad. Sci. U.S.A. 90 (23): 10962–6. doi:10.1073/pnas.90.23.10962. PMC 47901 . PMID 7902575. 1 2 Aguzzi A, Baumann F, Bremer J (2008). "The prion's elusive reason for being". Annu. Rev. Neurosci. 31: 439–77. doi:10.1146/annurev.neuro.31.060407.125620. PMID 18558863. ↑ Medori R, Tritschler HJ, LeBlanc A, Villare F, Manetto V, Chen HY, Xue R, Leal S, Montagna P, Cortelli P (February 1992). "Fatal familial insomnia, a prion disease with a mutation at codon 178 of the prion protein gene". N. Engl. J. Med. 326 (7): 444–9. doi:10.1056/NEJM199202133260704. PMID 1346338. ↑ Criado JR, Sánchez-Alavez M, Conti B, Giacchino JL, Wills DN, Henriksen SJ, Race R, Manson JC, Chesebro B, Oldstone MB (2005). "Mice devoid of prion protein have cognitive deficits that are rescued by reconstitution of PrP in neurons". Neurobiol. Dis. 19 (1-2): 255–65. doi:10.1016/j.nbd.2005.01.001. PMID 15837581. ↑ Balducci C, Beeg M, Stravalaci M, Bastone A, Sclip A, Biasini E, Tapella L, Colombo L, Manzoni C, Borsello T, Chiesa R, Gobbi M, Salmona M, Forloni G (February 2010). "Synthetic amyloid-beta oligomers impair long-term memory independently of cellular prion protein". Proc. Natl. Acad. Sci. U.S.A. 107 (5): 2295–300. doi:10.1073/pnas.0911829107. PMC 2836680 . PMID 20133875. ↑ Laurén J, Gimbel DA, Nygaard HB, Gilbert JW, Strittmatter SM (February 2009). "Cellular prion protein mediates impairment of synaptic plasticity by amyloid-beta oligomers". Nature. 457 (7233): 1128–32. doi:10.1038/nature07761. PMC 2748841 . PMID 19242475. ↑ Isaacs JD, Jackson GS, Altmann DM (October 2006). "The role of the cellular prion protein in the immune system". Clin. Exp. Immunol. 146 (1): 1–8. doi:10.1111/j.1365-2249.2006.03194.x. PMC 1809729 . PMID 16968391. ↑ Hwang D, Lee IY, Yoo H, Gehlenborg N, Cho JH, Petritis B, Baxter D, Pitstick R, Young R, Spicer D, Price ND, Hohmann JG, Dearmond SJ, Carlson GA, Hood LE (2009). "A systems approach to prion disease". Mol. Syst. Biol. 5 (1): 252. doi:10.1038/msb.2009.10. PMC 2671916 . PMID 19308092. 1 2 3 4 5 6 7 8 9 Laurén J (2014). "Cellular prion protein as a therapeutic target in Alzheimer's disease". Journal of Alzheimer's Disease. 38 (2): 227–44. doi:10.3233/JAD-130950. PMID 23948943. 1 2 3 4 5 Zhou J, Liu B (May 2013). "Alzheimer's disease and prion protein". Intractable & Rare Diseases Research. 2 (2): 35–44. doi:10.5582/irdr.2013.v2.2.35. PMC 4204584 . PMID 25343100. 1 2 3 Laurén J, Gimbel DA, Nygaard HB, Gilbert JW, Strittmatter SM (Feb 2009). "Cellular prion protein mediates impairment of synaptic plasticity by amyloid-beta oligomers". Nature. 457 (7233): 1128–32. doi:10.1038/nature07761. PMC 2748841 . PMID 19242475. 1 2 He J, Li X, Yang J, Huang J, Fu X, Zhang Y, Fan H (Mar 2013). "The association between the methionine/valine (M/V) polymorphism (rs1799990) in the PRNP gene and the risk of Alzheimer disease: an update by meta-analysis". Journal of the Neurological Sciences. 326 (1-2): 89–95. doi:10.1016/j.jns.2013.01.020. PMID 23399523. 1 2 Giovagnoli AR, Di Fede G, Aresi A, Reati F, Rossi G, Tagliavini F (Dec 2008). "Atypical frontotemporal dementia as a new clinical phenotype of Gerstmann-Straussler-Scheinker disease with the PrP-P102L mutation. Description of a previously unreported Italian family". Neurological Sciences. 29 (6): 405–10. doi:10.1007/s10072-008-1025-z. PMID 19030774. ↑ Zanata SM, Lopes MH, Mercadante AF, Hajj GN, Chiarini LB, Nomizo R, Freitas AR, Cabral AL, Lee KS, Juliano MA, de Oliveira E, Jachieri SG, Burlingame A, Huang L, Linden R, Brentani RR, Martins VR (Jul 2002). "Stress-inducible protein 1 is a cell surface ligand for cellular prion that triggers neuroprotection". EMBO J. 21 (13): 3307–16. doi:10.1093/emboj/cdf325. PMC 125391 . PMID 12093732.